Manual sweepers offer a convenient and economical option for wet and dry cleaning. Whether cleaning around your home, or professional-grade jobs, enjoy a faster, more thorough clean, at a fraction of the effort. 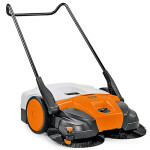 A standard sweeper from STIHL Shop Drysdale will help clean a wide range of areas up to six times faster than with a broom. We offer both professional and home-use models, capable of picking up wet and dry debris. 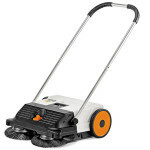 For larger areas, choose our state-of-the-art battery sweeper. Powerful enough to clear up to 2000m2, it can be used manually while the battery is recharging. Please contact us to find out more about our sweeper range. 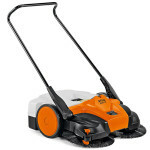 If you’re looking to tidy up your lawns, we also provide a range of mowers in Geelong to suit any budget and project.